What is “Vedic”? Is Krsna/Vishnu in the Veda? It is a fact that Vishnu (whom many Hindus and spiritualists claim is “The Supreme Personality of Godhead”) is of minor mention in the “Vedic” texts – if we consider “Vedic” to refer only to the literal words in the four books literally titled “Veda,” The Rg, Sama, Yajur, Atharva Veda. a) The Veda is never to be studied except under the guidance of a self-realized Guru. Otherwise the meaning is not clear. In previous aeons this was purposely done to prevent wicked people from gaining access to powerful knowledge. Thus Sanskrit texts contain millions of time more information than what is literally encoded into their syllables and lines. The “older” Sankrit texts, the four “Veda” named above, are especially impossible to correctly understand without a realized guide because they were written before the original authors fully realized the scarcity of intellect that would develop in the coming millennia of the Kali Aeon. b) Foreseeing the scarcity of self-realized guides in the coming aeon, ancient gurus tried to benefit modern seekers by recording their guidance in the form of commentary on the four Veda. These commentary are collected and named “Upanishada.” To claim that the Upanishada are not “Vedic” is fallacious; a part and parcel of the effort to understand the divinity without divine guidance. The Upanishads, in fact, are *more* Vedic than the four Veda because the Upanishada are the four Veda being explained to us by self-realized guides. c) The Upanishada, merciful as they are compared to the Veda, are still densely codified and terse in philosophical content. They require outstandingly serious discipline and self-purification to comprehend. Foreseeing that the citizens of our modern age would have little interest or ability to be disciplined and pure, the primary author of the Veda decided to *illustrate* the most essential and important underlying teachings of the Upanishads (and thus the four Veda) by recording select historical tales. We have these tales preserved under the heading of “Purana” and “Itihasa.” If it is foolish to declare that the Upanishada are not Vedic, it is twice as foolish to say the same of the Purana and Itihasa. Nothing could deliver true Vedic wisdom to our modern hearts and minds more directly and appropriately than these exciting selected histories of self-realized souls, explained to us by self-realized souls, as illustrations of the true meanings and principles hidden from unguided eyes in the four Veda. d) Vyasa, the main Vedic author, was still unsatisfied with his efforts to preserve spiritual knowledge for humanity. He felt everything had become too voluminous and thus inconclusive. He therefore composed the Vedānta – which literally means “the End of the Veda” to succinctly summarize everything within the Veda, Upanishad and Purana into a single conclusive book. 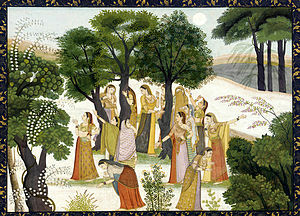 Such persons fortify themselves with castle walls of “reasoning” that excludes the reasonable conclusion that they are individually and collectively unqualified to mine any true meaning from the four Veda without divine guidance; and that this guidance is by and large easily available to them in the form of the extensions of the four Veda: the Upanishad, Purana, Vedanta, and most of all the Srimad Bhagavatam. Their castle of ignorance is elaborately fortified and researched, but it is like a child playing King Arthur, ignoring that they are not really qualified to be a king in a castle in the first place. The Vedic literature is by no means limited to the four Veda. In fact, the Vedic literature is by no means limited in any fashion whatsoever. That being true, the body of literature continues to grow even today. Although the progress of the Age of Kali has made scarce any valid contributions to the Vedic corpus authored by truly realized souls, this particular cycle of Kali has a uniquely important avatara of Kṛṣṇa followed by an avatar of Rādhārāṇī as Śrī Caitanya. In the immediate wake of these two avataras, an “Indian Summer” of self-realization blossoms and great contributions have been made to the recorded body of Vedic knowledge. In particular, the immediate followers of Śrī Caitanya (Śrī Rūpa, Sanātana, Raghunātha dās, Raghunātha bhatta, Gopāl, and Jīva Goswāmīs) elaborated extensively and beautifully upon the Srimad Bhagavatam. Their followers have also made significant contributions. Those whose hearts have the incalculable fortune of being open to appreciating the Supreme Personality of Godhead as a real person who is fabulously delightful, important, and all-encompassing, such souls will avail themselves of these Vedic literature and attain a spiritual goal that the four original Vedas actually makes all efforts to *conceal* due to its precious rarity. Next Gita 9.21 – What’s the point of trying to be good?